Submersible Non-Clog Pumps, Turbo Compressors, Mixers, Aerators and Vertical Turbine Pumps. Specializing in Odor, VOC, and hazardous air removal systems for treatment plants & pump stations. BioRem offers biofilter systems for permanent media, as well as the Biocube. Dutchland offers precast post-tensioned concrete storage structures for water and wastewater applications. Specializing in complete treatment systems including: Continuous Fill Batch Reactors (CBR), Advanced SBR Systems and Suspended Aeration Systems. Pump Station Bar Screens with vertical orientation capability, Multiple Rake Bar Screen, Drum Screens, Grit Classifiers, Washer Compactors, Spiral and Trash Screens. Glasco UV systems are utilized in a variety of applications including disinfection, TOC reduction, Ozone destruction, liquid sugar, chlorine destruction and chloramine destruction. FTC provides FRP water tanks that can be utilized for fire suppression, water, rain storage, etc. Tanks are assembled with bolt & gasket kits. Jet Aeration, Jet Mixing, Submersible Aeration, Floating Effluent Decanters, Radial Pod Aerators, Liquid Recirculation Pumps. Standard Solar is a leading solar developer with over 1,500 installations. Full service support includes: financial analysis, design, engineering, installation, financing, operation and maintenance. Ground, Parking or Roof Mount Systems are available. Custom designed Sewage Pump Stations, Water Boosting Stations, Flooded Suction, Submersible, Storm Water, Valve Vaults, Controls, Access Doors, Steel Tanks. Packaged Treatment Facilities including: MBR with plate/hollow fiber membranes, Biorotor™, BiorotorMBR™, BioDISC™ and Filtration Systems. MBBR / BIO Chip Reactor Systems, Custom designed Belt Presses, DAF Units and temporary treatment systems. Specializing in the UV disinfection in water and waste water with 25+ years of experience. Calgon's UV Systems are highly efficient and offerings include in-line & open channel systems. Specializing in Carbon Based Odor Control, Air and Water Filtration Systems. Very reliable and effective way of treating odorous compounds. Owner of Calgon Carbons Odor Control Division. Effective air release vacuum protection & surge alleviation for water & wastewater industries. 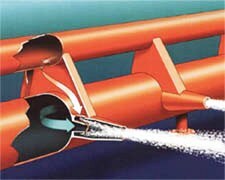 Cutting edge air release valves outperforms competitors.